A bird’s eye view of two buildings under construction in Manila. Growth in Philippine gross domestic product (GDP) exceeded expectations for the third quarter of 2016, accelerating to 7.1 percent from a revised 6.2 percent a year earlier, making the country the fastest growing Asian emerging economy among those that have released third-quarter data so far, the government said on Thursday. 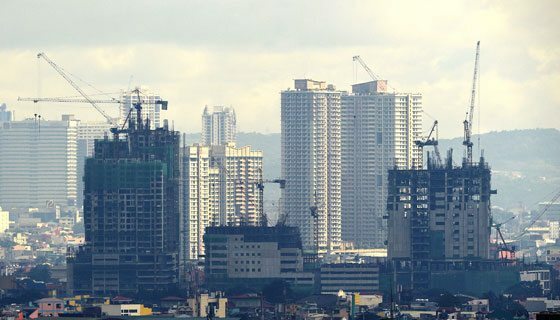 The third-quarter GDP rate from data released by the Philippine Statistics Authority (PSA) surpassed forecasts of 6 percent to 6.9 percent by economists polled earlier by The Manila Times, as well as the actual growth performance posted by China, Vietnam, Indonesia and Malaysia for the period. “[Ours is] higher than China’s 6.7 percent, Vietnam’s 6.4 percent, Indonesia’s 5.0 percent, and Malaysia’s 4.3 percent. India has not yet released its data,” said a statement by Socioeconomic Planning Undersecretary Rosemarie Edillon, delivered at a press briefing by National Economic Development Authority (NEDA) Director Reynaldo Cancio. Philippine economic growth in July-September also gained momentum from the second quarter of this year, when GDP registered a 7 percent expansion. It was also the fastest growth for the country since GDP swelled 7.5 percent in the second quarter of 2013. The third-quarter 2016 results bolstered cumulative growth for the nine-month period to 7 percent, the official PSA data showed. “From the demand side, investments continued to drive this economic growth, indicating its sustainability,” the statement read out by Cancio said. Public construction surged by more than 20 percent; private investment in construction rose 16.2 percent; private consumption by 7.3 percent; and exports of goods by 7.8 percent. Household consumption remained a pillar of strength for the domestic economy, Cancio said, noting upbeat consumer confidence as households put enrolment expenses at the top of their budget priorities. “The higher private consumption is also supported by low inflation, low interest rates, better labor market conditions and the steady, though slower growth in overseas Filipinos’ personal remittance. Government assistance such as the Pantawid Pamilyang Pilipino Program, or 4Ps, also provided additional boost to consumer demand,” Cancio said. From the supply or production side, the NEDA official noted recovery signs in agriculture, which grew by 2.9 percent after a prolonged drought caused by the El Nino phenomenon. Industries expanded by 8.6 percent, with manufacturing and construction stronger, while utilities registered steady growth. Services eased to 6.9 percent from the previous quarter and from a year earlier. Finance and economic managers said growth expansion in the third quarter means the government is on track toward attaining its growth target for the full year. The government has set a full-year 2016 growth target of 6 percent to 7 percent. Analysts have forecast GDP would grow between 6.4 percent and 7 percent during the year. For the first nine months of 2016, the economy grew by 7 percent, gaining traction from 5.7 percent a year earlier. The central bank sees the GDP results indicating no need to change its monetary policy setting. The NEDA said for the fourth quarter, the economy only needs to grow by at least 3.4 percent to hit the low-end target of 6 percent. To reach the high end of 7 percent, it would need to grow by 6.9 percent in the fourth quarter, the economic planning body said. “Together with a low inflation environment, sustained strong growth bodes well for continued poverty reduction this year. The services sector and sustained strong fiscal spending are also likely to continue to drive growth in the fourth quarter. Robust domestic demand will continue to bolster growth in the near term,” Cancio added. Agriculture and fisheries are also seen likely to continue to grow within the near term if the third-quarter momentum in the crops, livestock and poultry is maintained. The NEDA official said the manufacturing sector is expected to benefit from the strategic localization of industry roadmaps and robust domestic demand and will also benefit from the projected rise of imports of both advanced economies and emerging market and developing economies beginning 2017. “Construction also will remain a major contributor to growth due to the strong commitment of the government to implement a massive infrastructure investment program,” he added. Although optimistic, the NEDA said the government is still on guard against possible downside risks to the economy. Some of the risks mentioned were: agriculture and fisheries remaining vulnerable to the possible occurrence of La Niña; a clouded outlook for exports due to sluggish recovery in Europe and uncertainties on economic policies in the UK and the US; resurgence in the Arab region of the “Saudization” policy, or the replacement of foreign workers with Saudi nationals; and the need to consolidate efforts that will pave the way for lasting peace and development in the countryside. “Ultimately, what we should be concerned about is how the growth prospects for this year and beyond will translate to poverty reduction and improvements in the quality of life for Filipinos for the next six years,” Cancio said.